The Queensland Plateau in the Coral Sea off north-eastern Australia supports numerous submerged and emergent reefs. Osprey Reef is an emergent reef at the northern tip of the plateau ~1500 m in elevation. Over such a large depth gradient, a wide range of abiotic factors (e.g., light, temperature, substratum etc.) are likely to influence benthic zonation. 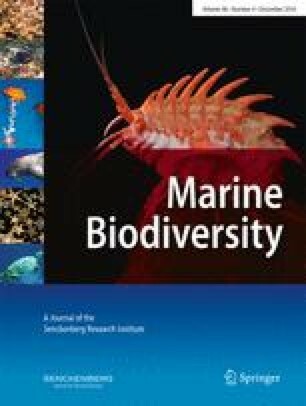 Despite the importance of understanding the biodiversity of Australia’s Coral Sea, there is a lack of biological information on deep-water habitats below diving depths. Here, we used a deep-water ROV transect to capture video, still photos and live samples over a depth range spanning 92 to 787 m at North Horn on Osprey Reef. Video analysis, combined with bathymetry data, was used to identify the zones of geomorphology and the benthic assemblages along the depth gradient. There were marked changes in the geomorphology and the substrate along this depth gradient which likely influence the associated benthos. Cluster analysis indicated five benthic assemblage groups, which showed clear zonation patterns and were generally predictable based on the depth and sedimentary environment. These results are the first quantitative observations to such depths and confirm that the waters of the Coral Sea support diverse benthic assemblages, ranging from shallow-water coral reefs to mesophotic coral ecosystems, to deep-water azooxanthellate corals and sponge gardens. The knowledge provided by our study can inform management plans for the Coral Sea Commonwealth Marine Reserve that incorporate the deeper reef habitats and help to minimise future damage to these marine ecosystems. The online version of this article (doi: 10.1007/s12526-015-0434-5) contains supplementary material, which is available to authorized users. We thank the German Research Foundation (DFG) for the funding (projects Wo896/7 and Lu839/3 to GW and CL, respectively) and Marum (www.marum.de) for the ROV equipment supplied for the Deep Down Under expedition (www.deepdownunder.de). We also thank the captain, crew and scientific party aboard the MV PMG Pride who undertook the sampling during the 2009 voyage. We thank Nicolas Nowald for assistance with the ROV raw data and Andrew Gray-Spence for the Python program coding used for the video data. Taxonomic help is gratefully acknowledged from Marc Eleaume, Richard Fitzpatrick, Merrick Ekins, Phil Alderslade, Stephen Cairns, Justin Marshall, Vanessa Messmer and Rudi Kuiter. We thank the two anonymous reviewers for helping to greatly improve the manuscript.